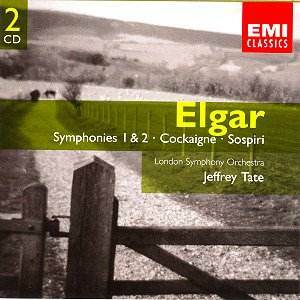 My delight at encountering another version of the Elgar symphonies, particularly conducted by Jeffrey Tate (given his excellent reputation), swiftly dissipated on a first listening. We must bear in mind that there are two ways of performing the Elgar symphonies. Exemplified by Barbirolli (or taken to an extreme by Sinopoli), is the old-fashioned way that prevailed in the 1930s and 1940s � slow, slushy and totally self-indulgent, wallowing and luxuriating in the sound rather than realising that there is an undercurrent to the work that must be obeyed, and thus holding the symphony back rather than allowing it to flow along at its rightful pace. The other, more modern way as practised by Solti for example, is to take the work at a more fitting pace, crisper and more precise, thus enabling the work to speak for itself rather than trying to draw out every nuance. Conductors such as Boult, Handley, Menuhin, Slatkin, Colin Davis and Andrew Davis tend to fall in the middle of these. From the very first it was evident that Tate intended to fall into the former category as the First Symphony � with which the first disc opens � commenced at a dirge-like pace. Look at the timings of the symphony � Elgar himself took 46 minutes, whilst the estimate in score says 51 minutes. Tate takes 54 mins � decidedly longer than Elgar intimated it should! The Symphony is extremely well-played, with the LSO on top form and producing a full, sumptuous, rich and lush sound, yet the too-leisurely pace drags it down, making it sound ponderous and heavy. All in all, the first movement comes across as slightly uninspired and desperately in need of propelling! The second movement is better, with an impressive sound including wonderful bass sonorities. The third movement immediately strikes one as slightly too grandiose as Tate tends to exaggerate the big statements - which may detract in some people�s appreciation of the performance - then about a third of the way through it starts to get lost, appearing to lose interest and direction, and becoming almost withdrawn at times. Again, it drags and is too lethargic, ponderously lacking in energy and forward-motion. It is then not until about a third of the way through the final movement, complete with its very weighty brass, that Tate finally gets the pace up a bit. The impressive coda came as pleasant surprise � this is just about as good as you�ll ever hear it. So a fairly mixed rendition of Elgar�s First � with a beautifully exuberant and opulent sound from the LSO, exquisitely played, and with a fantastic coda, yet too slow as a whole, and with some slightly ropey bits � as the slow movement in particular (almost half as long again as Elgar�s own version � 14 minutes instead of 10) lacked coherence, direction and propulsion. If one is looking for a decent recording of Elgar�s First Symphony, I would advise turning to one of those by Barbirolli (if one prefers the old-fashioned, indulgent method of performance), or Solti perhaps for a faster approach, and steering clear of Tate, despite his few redeeming qualities. The Cockaigne overture concludes the first disc. This was immediately more promising than the symphony. Tate commences with a suitably perky beginning. A beautifully earthy performance, it had greater contrasts from brash to tender than, for example, Zinman�s recent recording on the Telarc label. Unfortunately, Tate falls into the same trap as before with the symphony, and starts slowing down slightly too much in places � almost coming to a stop in the slow section about half the way through, from which it is extremely difficult to pick up the pace again. Despite this, it is an excellent performance � the LSO are perfectly, brilliantly in tune with the spirit and character of the piece, and the brass band section has precisely the right sense of swagger about it, (and the timpanist has a field day)! Tate tends to err on the side of self-indulgence and opulence � not that the performance is necessarily any the worst for it. So, overall, one of the better versions of Cockaigne and a strong ending to the disc. The second disc kicks off with the Second Symphony. Again, it immediately strikes one as too slow - even almost grinding to a complete halt at times. Checking it against Elgar�s own recording times, Tate, at 62 minutes, takes an amazing 15 minutes longer than Elgar�s 47! Despite a tremendous trumpet glissando half the way through, and a few other impressive and touching moments, the first movement is both too self-indulgent, and too disjointed � mainly the result of Tate slowing down too much then having to speed up again. The second movement continues in a similar vein as Tate wallows in a dirge-like, ponderous soup of sound, luxuriating in grand empty gestures and failing to push the movement on. Again, the consequence of this is a lack of cohesion and no sense of flow to the music. The third movement is a bit too relaxed to start with, although the heavy brass and percussion come across extremely well, and Tate manages to capture the restless, nervous energy at the end of the movement excellently � even if he does not endue it with enough malevolence for my taste. The fourth movement is a fairly disappointing conclusion to a disheartening version of the symphony � too sluggish, lackadaisical and lethargic. Again, avoid Tate for the Second Symphony � I would recommend Colin Davis�s version instead as a good all-rounder. The second disc ends with Sospiri � a better attempt than the symphonies, one felt � affectionate, vibrant and heart-felt, if slightly over-the-top and sentimental. The problem here seemed to be that Tate is trying to be too intense, resulting in a rather jagged performance that lacks the velvety smoothness that one finds in, say, John Eliot Gardiner�s rendition. As a general rule, the sound was slightly boxy on these discs, and despite accomplished playing from the LSO, and a competent version of Cockaigne, all these works can be found in better versions elsewhere.